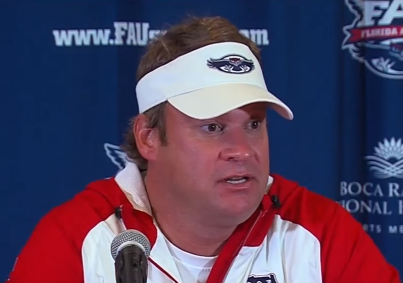 Florida Atlantic Head Coach Lane Kiffin met with the media on Monday to discuss the Owls' upcoming contest against Navy. Below is the transcription of that session, one that still leaves a few questions as the team draws closer to gameday. On Navy, what were you able to take away from Zach Abey? "That the last game really, really well. He was their MVP for the game for Navy’s team. You could see that he obviously got better after the injury coming in and playing and ending on a high note playing really well. I’m sure he has improved this off season. We are going to have our hands full." In their offense, how much does the quarterback add or is it the system? "I think it does a lot. You look at the last guy who was a really good player when he got hurt it took a little adjustment. Their numbers weren’t as big. They were on a roll with some really big scores in some games right before he got hurt, so obviously it is an important position. And, he got better over those couple of games and played very well at the end. Very important also is how well does the guy throw. He hit the big plays the few times they did throw the ball." Players turning anxiety into energy. Is that something you stress with the players? Most common word used by the players when describing Navy was discipline. Is this a good type of team to start the season off with? "They definitely are disciplined. The least penalized team in the country last year. They play extremely hard and make very few mistakes. That is why they are really hard to beat when they do that. I don’t know if it is a good thing to start with (chuckle). It means you will have a really big test right away. You are going to have to play really disciplined football because they are not going to screw it up. You are going to have to win all three phases to win this game." What do think the atmosphere will be like in your first game here? What do you expect the day to be like? "I think it will be exciting. The day not so much. The night being an 8 o’clock game I think will be really exciting. Is it as many people as I’m used to or the stadium, no, but I think at the same time knowing what these players have been used to hopefully it will be really exciting, a really electric crowd and excitement." What do you think your emotions will be? "I don’t know. I have kind of been there, done that. I’m not worried about myself. I need to make sure the players are ready to go." Having not picked a starting quarterback, have you seen from all three quarterbacks more of a razor sharp edge with all thinking it could be them? Does that come into play? "I think it does. Anytime you can keep it competitive, you guys will see our depth chart, there is a lot of ‘ors’ on our depth chart where we are keeping guys competitive (in) positions where multiple guys are going to play at a lot of spots. With the quarterback, we are still figuring it out." Do you think that there will be an official starting quarterback heading into the game that we are aware about? That the players are aware of? "I don’t know if you will be aware of it. Our players will be." "Whenever we figure it out for sure." You wouldn’t wait until right before the game or would you? "Probably not right before the game. You would want them to know at practice. That last final practice. Who their guy was and who they are playing with. It could be multiple guys." Have you decided if it is a multiple system might look like whether it is by guys, first half/second half? "I think it depends on which two you are down to in that situation because two are kinda more similar than the other one. And so, it could be a situation where two guys are playing and calling the same plays or it could be a situation where you call different plays with one guy." What did you see from the quarterbacks this morning? "DeAndre (Johnson) was limited. Did some things. You asked that question before. I think it keeps them all competitive knowing they are all getting reps. No one is down on the service team. So, I think they improved." Did DeAndre go on Sunday? "Did he go on Sunday, yesterday. No he did not but he did today." So it is a step forward? With all the new guys that came in before camp and during camp, how do you think they have meshed together as a team or do you really know? 'I think that I understand the expectations are really high that we will win every game. That would be great right away, all of a sudden just because we changed coaches. But, I think this team what you will see is that it will improve throughout the year. You have to look at what you did. It was almost like an expansion team a little bit, as you look at so many new guys. It takes a while to gel. We have guys that have been here for a week or two weeks so I think that what you will see is that we will continue to improve throughout the year. Anytime that you take that many new guys that is usually the case." Do you think that they have bonded? "I think so. There have been very little issues at all with our players. We don’t have any issues with guys practicing hard, attitudes or anything. I have said it before, I think there was a really good culture here before of kids doing the right thing and disciplined and I think these new guys coming in have bought into that." "Yes, because in this game especially. You are going to have limited possessions. Limited plays, not what we are used to in tempo offenses. You can’t afford mistakes because you just don’t get the ball back. It takes forever to get it back in this game at times. So, we cannot make mistakes. Not just at quarterback but everywhere, offense and special teams." Will you make position changes after this game because of the different styles? "Potentially, it is going to be who we think is the best guy to win that week. Usually, that’s the same guy but you never know." If injuries will you go to the next guy down or slide someone over (OL)? "We always plan for every situation. The last place I was at was the best ever at doing that, Coach Saban. You have specific plans for that and we repped that throughout the week and what those are going to be. As you mentioned, it is not always the second guy that goes in. It is the best lineup. We are always looking at that." Alabama always has had the best starts to seasons. What did you learn from Saban in that aspect? "That is not by chance. He (Saban) probably starts the seasons as well as anybody ever. I truly believe that is because of the four quarter program…training camp is extremely difficult, very hard and very competitive. I think that that has been a huge part to why they start so fast. Because it is almost like as other teams are starting they have played some games. I have been there for 160 play scrimmages. I know that a lot goes into that and it is a big part of why they are so successful." What is it about the fourth quarter program? "It is very demanding. A lot of stuff in the weight room. A lot of stuff on the field. It is tough. Guys struggle with it, initially. I believe it pays off by the time you get development." FAU will kickoff against the Midshipmen on Friday night at 8:00 PM from Howard Schnellenberger field. The game can be seen on ESPNU. Thank you Rick (or whoever does these if not Rick) for transcribing this. I know it's a time-consuming process and I appreciate it.